Liwa Thuwar al-Raqqa (the Raqqa Revolutionaries Brigade) was initially formed in September 2012 as a merger of several local rebel groups in Raqqa province following on from the Assad regime’s loss of the northern border town of Tel Abyad, at a time when the regime was forced to pull back from large swathes of northern Syrian border areas to focus on defending more vital areas- in particular the provincial capitals. Liwa Thuwar al-Raqqa declared its loyalty to a “Revolutionary Military Council” in Raqqa province, a loose umbrella similar to other early nationalist rebel structures like the FSA Military Council of Col. Oqaidi in Aleppo province. Some declared components of Liwa Thuwar al-Raqqa at the time included [Kata’ib] al-Jihad fi Sabil Allah, al-Nasir Salah al-Din, al-Haq, Shuhada’ al-Raqqa, Saraya al-Furat and Ahrar al-Furat. Over the subsequent months, some new local formations were announced and added to Liwa Thuwar al-Raqqa’s ranks. Thus, in December 2012, the Katiba al-Risala of the village of al-Sheikh Hassan in the north Raqqa countryside, the Katiba Suqur al-Jazira operating in the western Raqqa countryside, and the Katiba Usud al-Tawheed operating in Raqqa city area were announced as affiliates of Liwa Thuwar al-Raqqa. The rhetorical focus in these videos is on driving the Assad regime presence out of Raqqa province, rather than laying out an ideological vision for a post-Assad Syria. This is so despite its original emblem that ostensibly conveyed a distinctly Islamist orientation. Also in December 2012, Liwa Thuwar al-Raqqa joined the Raqqa Liberation Front coalition, alongside similarly aligned groups including the familiar Ahfad al-Rasul (a brand of Western-backed brigades that went into sharp decline in 2013, including expulsion from Raqqa city by ISIS in August of that year), Liwa al-Muntasir bi-Allah and Liwa Isar al-Shamal (both of which, like Liwa Thuwar al-Raqqa, identified as part of the same Revolutionary Military Council) and Liwa Rayat al-Nasr (which eventually joined the Salafi grouping Ahrar al-Sham). As has often been the case in the Syrian civil war with the various coalitions announced and dissolved, the Raqqa Liberation Front coalition never led to a real merger of these groups. Raqqa city fell in March 2013 to a combination of these brigades, Ahrar al-Sham and Jabhat al-Nusra. The following month, Abu Bakr al-Baghdadi announced the creation of ISIS, demanding the subsuming of Jabhat al-Nusra under this structure. Most of the Jabhat al-Nusra contingents in Raqqa province accepted Baghdadi’s argument and defected, though a group under Abu Sa’ad al-Hadhrami broke away from ISIS in Raqqa city and temporarily took refuge in the city of Tabqa to the west of Raqqa city in mid-summer of 2013. Meanwhile, Liwa Thuwar al-Raqqa continued to operate as part of the rebels’ wider bid to take the remaining regime bases in Raqqa province- Division 17, Brigade 93 and Tabqa military airport. Thus on 20 June, Liwa Thuwar al-Raqqa’s leader Abu Eisa denied claims he had been killed by regime forces. 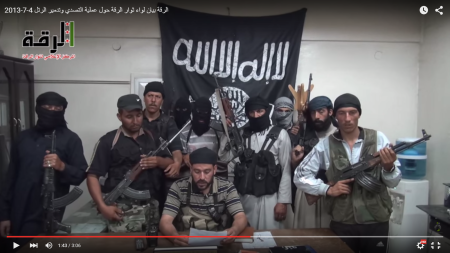 It is also notable that Liwa Thuwar al-Raqqa appeared to adapt somewhat to the ISIS presence in Raqqa, not only by adding the definite adjective ‘al-Islami’ (Islamic) to its name but also by using the same flag as ISIS in at least one video, as per below from July 2013, in which the group claims coordination with a number of formations, including ISIS, Jabhat al-Nusra and Ahrar al-Sham, Liwa Ahfad al-Rasul and Liwa al-Muntasir bi-Allah, in attacking a convoy that came from Brigade 93. Despite the apparent military cooperation, tensions became increasingly apparent in a number of ways. As ISIS’ presence in Raqqa city grew with its da’wa office that set up numerous billboards throughout the city, it began detaining members of other groups, such as the leader of Liwa Amana’ al-Raqqa (another of the independent, nationalist brigades), and moved decisively to expel Ahfad al-Rasul in August, despite cooperating with the same group on the Latakia front where an offensive had been launched to push towards Assad’s ancestral village of al-Qardaha. This does not mean tensions solely revolved around disputes between ISIS on one side versus the rest of the factions on the other. 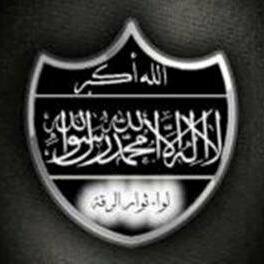 There were also tensions between Liwa al-Nasir Salah al-Din (another independent group at this point) and Ahrar al-Sham as they arrested each other’s members, and Liwa Thuwar al-Raqqa reportedly had its own disputes with Ahrar al-Sham as well. Even so, all-out warfare between the various factions had not yet broken out, and the civilian local council continued to operate. In September 2013, Jabhat al-Nusra announced its ‘return’ to Raqqa city. Some of the smaller brigades saw in Jabhat al-Nusra the chance to protect themselves from the growth of ISIS, and accordingly pledged allegiance in some form. This included Liwa Thuwar al-Raqqa, though the exact terms of the allegiance are disputed. It appears Jabhat al-Nusra had hoped to integrate Liwa Thuwar al-Raqqa through Shari’a sessions, but regardless of whether or not this was actually agreed upon, it is therefore clear that Liwa Thuwar al-Raqqa was not properly integrated into Jabhat al-Nusra’s ranks. This may have hindered the fight against ISIS when wider infighting broke out in January 2014. Components of other actors saw a stronger horse in ISIS (which detained and eventually killed Abu Sa’ad al-Hadhrami) and thus joined its ranks, a case-in-point being part of the Liwa al-Nasir Salah al-Din. As infighting spread between rebel forces and ISIS, Liwa Thuwar al-Raqqa appears to have taken the lead in fighting ISIS inside Raqqa city in January 2014, at which point it had broken off from Jabhat al-Nusra. However, ISIS did not suffer the same problem as elsewhere (e.g. in Idlib province) of being thinly spread out and was able to consolidate control of Raqqa city, expelling Jabhat al-Nusra, Ahrar al-Sham, Liwa Thuwar al-Raqqa etc. It would appear that the rebel side conversely suffered from problems of poor coordination in their efforts. Liwa Thuwar al-Raqqa then withdrew into the Raqqa countryside up to the Kobani enclave, seeking refuge with the Kurdish YPG. As the Liwa Thuwar al-Raqqa break-off from Jabhat al-Nusra had not been officially announced at the time, this was the origin of the ISIS narrative that Jabhat al-Nusra had entered into an alliance with the YPG. In April 2014 came Jabhat al-Nusra’s announcement of the break between itself and Liwa Thuwar al-Raqqa. As the months continued, Liwa Thuwar al-Raqqa claimed occasional low-scale sabotage attacks and clashes with ISIS in Raqqa province, usually in coordination with another brigade that also took refuge in the Kobani canton: Liwa al-Jihad fi Sabil Allah, aligned with the opposition-in-exile. Thus on 9 June 2014, the two groups claimed to have attacked an ISIS bridge and checkpoint installation near Raqqa city. They also sent a message of solidarity to the rebels in Deir az-Zor province as ISIS continued its advance and threatened to overrun the entire province. Liwa Thuwar al-Raqqa also claimed a prisoner exchange with ISIS, in which the former released 3 ISIS operatives in exchange for 13 prisoners held by ISIS. In September 2014, Liwa Thuwar al-Raqqa along with a number of rebel groups in the Kobani area joined the Burkan al-Furat (‘Euphrates Volcano’) coalition led by the YPG, and participated in the battle of Kobani as well as the subsequent push eastwards following the failure of the Islamic State to take the city. Liwa Thuwar al-Raqqa appears to have been the main rebel auxiliary force alongside the Kata’ib Shams al-Shamal formation of the Dawn of Freedom Brigades, which unlike Liwa Thuwar al-Raqqa draws its membership mainly from rebel groups (e.g. Liwa al-Tawheed) that existed in north-eastern Aleppo province localities such as Manbij. 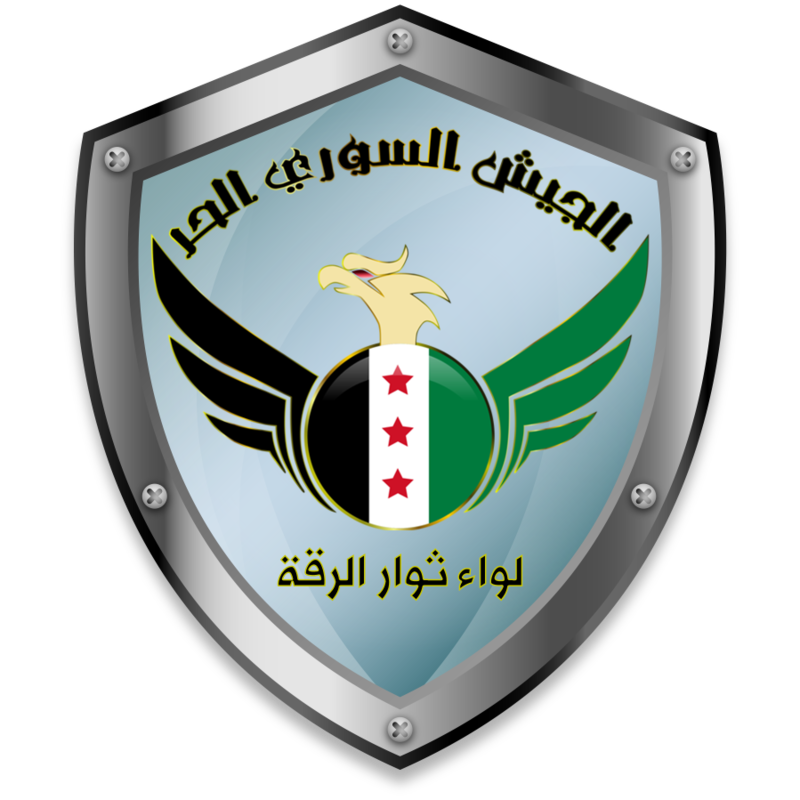 “Free Syrian Army: Liwa Thuwar al-Raqqa”, with the familiar FSA emblem. At the present time, Liwa Thuwar al-Raqqa appears to be the primary rebel actor responsible for outreach to the Arab tribes in northern Raqqa province (e.g. photo below), also claiming administration over the Ain Issa area to the south of Tel Abyad. One should also note the reference to a ‘local council’ here: on 26 August, Liwa Thuwar al-Raqqa issued an invitation for participation in a conference for the election of the local council for Raqqa province, particularly calling on members of the nominal electoral committee to participate. This conference was supposed to take place on 28 August in the Turkish city of Urfa, but as the Arabic outlet al-Aan notes, it failed to lead to the election of a local council. Out of 107 members of the electoral committee, only 4 showed up alongside representatives of the opposition-in-exile government. It would appear that the majority of those from Raqqa province in exile do not see it as worthwhile to elect a local council to provide civilian support to Liwa Thuwar al-Raqqa, recognizing that the Islamic State still controls most of the province and the PYD is the true administrator of the important town of Tel Abyad, for which the PYD has already formed its own local and seniors councils. This is why, as I have emphasized before, it is highly misleading to go by Thomas van Linge’s maps that portray Tel Abyad and similar areas as somehow jointly controlled by the YPG and the ‘FSA’, driven as Thomas van Linge is by an ideological agenda to hype supposed Kurdish-rebel unity. Yes, it may be that the PYD takes into account for the time being local Arab and Turkmen objections to incorporating Tel Abyad into Kobani, and certainly it has little interest in pushing further south to Raqqa city and thus delegates an area like Ain Issa to Liwa Thuwar al-Raqqa. Yet the playing up of ‘YPG-FSA’ cooperation tends to ignore the fact that the YPG has done the bulk of the fighting, sustained the bulk of the casualties, and as a result its political wing the PYD has come to be the administrator of the vast majority of localities retaken from the Islamic State. Corroborating this point for the Tel Abyad area in particular is an order from the PYD’s Asayish police division forbidding travel between Tel Abyad and Raqqa, as well as importation of various goods from Raqqa to Tel Abyad, including building materials, fuels and electrical and manufacturing apparatuses. While these decisions are understandable in that the PYD worries that bombs may be smuggled in amid the imported goods and wants to cut off as many revenue sources as possible for the Islamic State in so far as the continued cash flow between non-Islamic State and Islamic State-held areas is key for Islamic State revenue via taxation, it is clear there was no consultation here with the rebel groups in Burkan al-Furat. To sum up, we have traced the evolution of the rise, fall and re-emergence of Liwa Thuwar al-Raqqa from 2012 to the present day, first as one of a number of indigenous, nationalist rebel groups in Raqqa province, to a non-ideological Jabhat al-Nusra affiliate, and finally to an uneasy, junior partner of the YPG. To shed further light on these issues, below is an interview I conducted recently with the director of Liwa Thuwar al-Raqqa’s media office. Q: Where was Liwa Thuwar al-Raqqa established and from where are most of the members of Liwa Thuwar al-Raqqa (i.e. Raqqa, Ayn Issa)? A: It was in the north Raqqa countryside in the border town of Tel Abyad. Most members are from Raqqa, some from Raqqa, others from the countryside. Q: Jabhat al-Nusra says you gave bay’a [allegiance] but you deny you gave bay’a to them? You mean it was just a military alliance? A: Yes an alliance to expel the Dawla organization from Raqqa. Q: And when did the alliance end? A: It ended because of their lack of support for us during our battle with Da’esh and they withdrew from Raqqa without informing us of that. Q: In their statement on the end of the alliance they say that you had agreed on Shari’a sessions. True or not? Q: After Raqqa fell to Da’esh’s hand, did most of their [Liwa Thuwar al-Raqqa] members go to Kobani? Q: How many martyrs do you have from the battles in Kobani, Tel Abyad and Ain Issa? A: I am not sure but approximately 30. Q: Many of the factions say the PYD wants taqsim Souria [division of Syria]. Do you agree? A: Yes. They had a plan of division but amid our opposition to the matter of joining Tel Abyad to Kobani [canton] our opinion was taken into account. Q: Is Liwa Thuwar al-Raqqa administering any areas? A: Currently only the locality of Ain Issa. Q: I heard that you are trying to establish relations with the tribes in the north Raqqa countryside. What are the names of these tribes? Q: Do you want a civil or Islamic state? Q: With regards to the other battalions in Burkan al-Furat are they administering liberated areas or do they only have a military presence? That is, if I understand correctly, Kata’ib Shams al-Shamal for example wants to recover Jarabulus and Manbij? A: Yes, they want to recover Jarabulus and Manbij and administer them. Q: When do you expect that you will try to recover Raqqa city? A: When we are given sufficient support we will recover Raqqa city soon, but if things remain as they are the time to liberate it will be delayed a lot. Q: Do you have relations with the Syrian opposition in Turkey or are you independent? A: No, we are independent. It would be very interesting if in future you could include in your articles information on the finances of the different groups. The details you provide in your articles are very good, but that financial aspect would make it really complete. Only a complete optimist with no realism believes, that a country where the army, police and civil administration are “erased” becomes a democracy the next week. It did not happen so in Iraq, Afghanistan, Somalia or Libya. And most certainly it will not happen so in Syria. Even the most slow person in US regime should begin to understand that fact, if the stability and future democracy is the aim. But obviously it has never been the real aim for USA and especially not for the Gulf states. The West and Gulf states have invested billions in training, arming and financing the Free Syrian Army and what is to show. A small ultra fragmented force, which becomes ISIS and Al Qaida every time USA turns its head. Who will fill the vacuum when Assad goes and the administration disintegrates? Turkey and Israel will not send those hundreds of thousands soldiers needed to keep discipline. The “Free” army is made to minced meat in days by the dominant Sunni extremist herds. What then? New wars. The reality is that Europe can and will not take much more refugees from Syria and Middle East. The public will not allow this to continue longer. In couple of months Europe will have to force peace and order to the region in order to stop that mass immigration. Syria is pacified fastest by supporting what Russia is aiming. Europe can not allow Yemen be turned to a completely failed state or a war against Iran. These would mean from over 100 millions population millions of new potential immigrating refugees. What country will take them? Europe needs a solution and fast. The US and Gulf policy is no solution which forces Europe to choose a more independent line. Demanding Russia and Iran to take the responsibility and Sunni refugees is hilarious. What would Tara and M say if hundreds of thousand Syrian Sunnis go to Iran? Demanding Russia and Iran to take the responsibility and Sunni refugees is hilarious. Not to worry Hopeful. Finn Sim, our resident Resistance Pro™ cheerleader is VERY consistent. Russia, Iran and the Yellowjackets can do whatever they want, like refusing to take the refugees they’ve created, but for some reason, Sim wants the Joo State to take them in. Makes perfect sense. Akbar,our Jewish American Zionist bullhorn, it is most certain that ISIS and Al Qaida were created are run by Assad, Iran and Russia. Of course the Zionists treat in their military hospitals wounded extreme Sunni militias so that Syrians can achieve democracy the day Assad is kicked out. Of course Saudi Arabia wants democracy to Syria, but not so much to Saudi Arabia. Of course Jews are worried of the human rights of Palestinians in Syria, but are not willing to give them to Pals under their rule. ETC. God gave Israel to Jews and Netanyahu is a man of peace and tolerance. And Akbar promises to take a Syrian refugee family to his empty apartment in Haifa. I see the truth isn’t part of your repertoire. Jews give human rights to all people “under their rule”, including arabs, jews, christians and muslims. But that’s OK, just make sure Russia and Iran don’t have to take any responsibility for their militant actions, which PALE in comparison to Israel. Resistance Pros™ have that special “Get Out of Jail Free Card”. Netanyahu is a man of peace and tolerance. Akbar you are a funny propagandist. Do you seriously believe that anybody with functioning brains believes such garbage you write in comment number 5? It is not me Akbar who claims that God gave Israel to Jews. I read daily tens of comments where Jews claim that happened and so Jews and only the Jews have the right to the lands of Israel. That “God gave” reasoning is the most common explanation by Jews why Israel belongs to them. So it is certainly not irrelevant. By the way Akbar have you already killed your chicken – Kaporos – on the streets of New York. It is legal – for Jews, but most certainly not for us gentiles. By killing the chicken the Jews transfer their sins to the bird. I wonder what kind of a giant bird Israeli leaders need to achieve that? Netanyahy surely needs a farm of ostriches for achieving that “transfer”. I never called for erasing anything. Assad is not Syria. Confounding Assad and Syria is the definition of willful idiocy. Btw in your reply you failed to answer my question. In case you missed it, how many refugees has Syria’s “allies” taken it? Sami let’s not be idiots. Assad is the president of Syria. Who is the popular figure who represents the “real” Syria? ISIL or Al Nusra? Or these “Free” people? It is willful idiocy to claim that there is some popular united political/religious movement which represents the “real Syria”. There are plenty of rival militias which can not agree even is the sun shining outside. Naturally people like you can say it likely that the Syrian Army, police and administration can/will stay in place. It is certain that the strong militias will not agree with that. The victor revenges – always. In Finnish civil war in 1918 many more were killed and died when the battles were over than in actual battles. Thousands were executed and died to hunger and diseases on concentration camps. That happens always in civil wars. If you believe that when Assad is killed or put on a plane to Russia, the militias put their weapons down and next month there is a secular western style election, you are free to have that dream. But it will be only a dream. The core question is only who will control and rule Syria after Assad. And how it is done. See what happened in Libya and Libya is a relative simple country compared to Syria’s complexity. Believing that when Assad leaves everything is solved by that is daydreaming. It has gone 20 years when Siad Barre was kicked out and Somalia is still in violent chaos. What made Assad “President” of Syria? It was definitely not the Syrian people. You don’t inherite the role of a president of a republic. That’s not how republics work. Assad is a leader of a gang of thugs. The fact that he kills, exiles or tortured the moderate voices shouldn’t legitimize him. He has failed Syria in every sense. Lastly, those so called “allies” have taken in none. 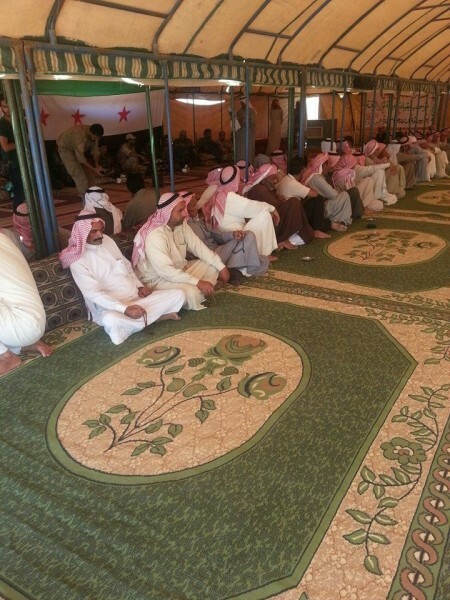 As of right now those GCC sheikhs have done more for Syrians than the so-called allies. Chew on that while trying to come more ways to whitewash a criminal thug. Australia has commenced airstrikes in Syria. Australia?! Why in the world would Australia want to get involved in this mess? It seems that what we have is a mini-World War on Syrian soil, and no end in sight. Russia is doubling down, making sure there is no fall of the regime if they can help it. The story that the West ignored Russian offers to settle the problem in 2012 only adds to the sense that Syria and its people have been sacrificed to the whims of geopolitical maneuvers. With all this in mind, it would seem only fair that the world share the burden of helping Syrians in their time of need. Here we ago again. Blaming the West for Assads actions. Had Russia and Iran not backed Assads thuggery from day one, and have done nothing to curb his relentless bombardment of Syria then we would not be talking about Assad or any other failed proposal. The fact remains Russia threw every road block up to help the Syrian people transition peacefully from the Assad dictatorship to a true republic. The Russians should be reminded that their vetoes at the UNSC has and remains to be the biggest impediment to a peaceful Syria. Here we ago again. Blaming the West for Assads actions. That’s what tin-pan despots and Presidents-for-Life do. They can’t do anything else like bring freedom, security and economic improvement to their people, so they, as a rule, blame others. And when they don’t perform, who is going to challenge them? Thank God they have cheerleaders like Russia, BDS, and other Resistance Pros™ to help massage their egos and support their hold on power. Without these groups, Assad would have been gone long ago like Saddam and Gaddafi and Syrians could have started to rebuild their ruined state. If you fellas can’t figure it out, I’m blaming all sides. There are no good players in this drama. The Syrian people, the vast majority being unarmed ones, however, are not to blame, and paying the highest price. At the time of Ahtisaari’s visit to New York, the death toll from the Syrian conflict was estimated to be about 7,500. The UN believes that toll passed 220,000 at the beginning of this year, and continues to climb. The chaos has led to the rise of Islamic State. Over 11 million Syrians have been forced out of their homes. I was just thinking about Zabadani and how if the Assad camp ever eventually took it, any elation over the ‘victory’ would be subdued by the length of time and energy taken in the process. For many weeks we’ve heard regime/hezbo claiming imminent victory. Continuing from previous post, observing the picture a few other thoughts cross my mind. The Ayatollah profile/sillohette appears to be facing east, in the direction of Iran (?). A yellow road/river runs through the profile dissecting it in half. Could this mean Iranian involvement and interests, puppets/agents (Hezbo, Assad) will meet their destruction and graveyard in Zabadani? Hezbo should come to their senses and not commit suicide for Iranian interests. This is no religious calling, and hezbo is on a futile adventure. The Ayatollah profile appears beardless perhaps signifying fake religious authority misleading hezbo and co to their doom. Also, Australia getting involved just highlights the absurd proportions of this conflict. Even Canada is involved in airstrikes now, thanks to the utterly idiotic Harper government. I mean, were Australia getting involved in Papua New Guinea or Fiji, it may have made a little sense. But in Syria? Each, who criticizing the Syrian government, its allies, Iran and Russia, confirms that all mentioned countries are powerful enough to make their opponents weak with limited options, and it reflects the crisis of violent confusion that you suffer! No use of chatter and heretical and deception maneuvers because it shows confusion in your thinking and deviation in the implementation of your work. Assad is against Israel (or so he says). And this what counts in SimoHurtta’s eyes. It is not the love for Syrians, but the hate to Israel and to Jews in general. Arguing with SimoHurtta is futile and a waste of time. It’s like trying to convince Goebbels that Hitler is bad. Obama’s so-called war to degrade and destroy it is a complete fabrication. Defeating it is simple. Stop recruiting, arming, funding, training and directing its elements. Stop using terrorists as US proxy foot soldiers. Wage peace, not war. Isolated on its own, it’ll wither over time and disappear, or be too impotent to rampage like now. Peace is anathema. So are democratic freedoms. America’s agenda intends a ruler/serf world unfit to live in – greed and rapaciousness triumphing over equity and justice for all. The end of the Revolution has been agreed between Russia and Obama. By the Iran Deal the US have given green light to Iran to invade, control, administate and organize all of Syria, Iraq, Lebanon and Iran. The ethnic cleanse will be executed by Syria, Russia and Iran in the north of Syria with the agreed cooperation of Germany (UE) and the US who will get most of the billionaire contracts in Iran and in the reconstruction of Syria and Iraq. Jordan will be forced to give up support for the rebels in the south. Iraq will be a shiite democracy, where shiite will always win. Syria will be demographically modified and will guarantee majority against sunna. It is not the love for Syrians, but the hate to Israel and to Jews in general. Sim hates Jews and Israel. His loss! Not sure how he became a hater, it seems there are a lot of people in Finland that like Israel. <i?One of these supporters was the head of the Israel-Finland Friendship Associations, an organization founded in 1957. He was very excited about the Israeli deal. "I think it's a wonderful idea," he says in fluent Hebrew. "We have 750 Finnish, Christian and Jewish members in the community, and I plan on recommending that they buy homes in the Israeli island, even though I personally cannot afford it." He notes that the Finnish government has been trying to encourage outside tourism for years. "Perhaps the Israeli chutzpah can bring tourists here." Do a lot of people think like you? "Generally, the Finnish people love Israel and in my opinion they're very happy the Israelis chose to invest here. In any case, we're trying to separate politics from business." Wikileaks from 2006 reveal a clear plan by the US government to destabilize Syria by targeting its vulnerabilities and certain possible actions for regime change. And the media followed suit. Finland has 178,947 islands. So if Israeli Jews want to buy one of them it is OK. Lets hope they pay in cash, the Ponzi scheme boys of Israel have a reputation of avoiding real payments. By the Akbar the locals are a bit suspicious about that a “Only For Jews” training center is established in their community. One guy said in the article that they are going to firing range to practice – in order to be on the safe side. Sadly the article in the major Finnish newspaper is in Finnish. By the way Akbar Israel is now under boycott in Reykjavik Iceland. Hups… maybe in Helsinki next year. /Sim hates Jews and Israel. His loss/ sick from an inferiority complex, and stupidity and lack of arguments! So if Israeli Jews want to buy one of them it is OK. Sounds fine Sim. Glad you agree. Considering that there are so many Pro-Israeli people in Finland and throughout Europe, I don’t think a handful of anti-semites are going to have much impact. We can only hope! Maybe you can do something to stop Finland’s business with Israelis. A nice big poster just may do it. Anyway, Israel’s GDP and economy are doing fine, and if the BDSers don’t care about the welfare of arabs outside of Israel, then, I guess, we’re all good. I rather jump from a tall bridge than live with Finns. Here at least I can oppress some palestinians for lunch, and bake bread for dinner, using small Arab children blood. What will I do in Finland? drink alcohol and go to sauna all day? too boring. Not to mention the shity weather..
You’ll be happy to know that there are more Jews in Israel than Finns in Finland. What our people have accomplished is nothing short of a miracle. It is now time to share our success with our cousins, but I think we need to be asked first. We should make way for Putin to battle ISIS. We should stop the coalition fight against ISIS and welcome with open arms the Russian army in Syria to fight along side the SAA this entity. This is especially since the outcome is dismal: the Pentagon is cooking up fake number of effective bombing runs and the $ 500 million allocated to train Syrian rebels to fight against ISIS has amount to a glorious total of 5 yes five fighters only available. How crazy and silly a wounded man can go on to say such stupid criminal statement , Assad invited HA and Iran to fight his Syrian people , and now he is calling Russia to kill Syrians, this is a criminal mind, the Alawis losing the fight , now they are calling the foreigners to fight for them , what a criminal regime! Sharing is not something our neighbors want, or used to. They want it all; so we have no other choice, but to keep it all. Until the day that they would be ready to share. The rumor is the iranian Taco Supreme will recognize Israel if they commit suicide. This is something you should consider. It would be a great step foward for beace. Apparently Joshua Landis has stolen my idea of separating the sects and the people of Syria as they have not been able to live together and the death of the national identity that I had proclaimed some time ago. He is proposing two Syrias one in the North and one in the South. The barrage of lies about Isis and its alleged relationships with the regime and Iran seem to be drying up after western intelligence realized that support for Isis is coming from NATO allies and factions fighting under the moderate rebels flag. Many in the opposition are Nusra cheer leaders, others are waiting to see how well Nusra will do before they take a position. And here is another moment of hilarious example of a coherent foreign policy: instead of inviting Putin to combat ISIS from the get go and get ourselves out of the region, we are ready to talk to the Russians. All of this so that when Putin comes to the UN he gets a world leader welcome. Talk about bruised egos. till the end of all the people of the ME. the might of the Chinese dragon must be attending (with Russia) in Syria categorically. It’s the Saddam Regime, not the Assad Regime. Granted they find common cause and work together to eliminate any one else. IS/ISIS/Al-Qaeda in Iraq/Zarqawi doesn’t want Damascus, they want Baghdad. While we’re on the subject, in all the chemical weapons incidents, to my knowledge, it’s never been against ISIS. Granted it wouldn’t be, since they work together, but I wouldn’t bet the ranch it’s ever been Assad.